The MP3-445 is a highly versatile, highly configurable MP3 player and automation interface with an onboard audio amplifier and extensive electrical input and output options. It can be everything from a doorbell, to the control center for a complex public multimedia display. It operates independently or using the built in serial interface, it can control other devices or be controlled by other devices, including computers. • Solid-state Compact Flash MP3 Player supporting MPEG2 Layer 3 Stereo decoding at all MPEG sampling frequencies and bit rates up to 256 kb/s including variable bit rate (VBR). • Operates in two stand alone modes (simple & enhanced), and a peripheral mode (interfaced to a remote computer or other device). • Line-level unbalanced/balanced-isolated stereo outputs. • On-board power amplifier capable of 2 x 25W stereo outputs with output AC/DC short-circuit protection. • On-board L-R channel volume control. • 16 switch inputs with transient protection. • 16 outputs with 250mA continuous or 1.5A pulsed current per output. • Supports Compact Flash Cards type I and II with capacities up to 4GB. • Standard serial interface (RS-232) running at 9600 baud. • DIP Switch selectable level/edge triggered inputs and audio level adjustments. Outputs…………………250mA continuous and 1.5A pulsed current per output. Up to 256 kb/s including variable bit rate (VBR). Dimensions…………….203mm (L) x 137mm (W). CF card exceeds longer edge by 12mm. Mounting………………4 holes dia 3.35mm spaced 190mm horizontally and 123mm vertically. Inputs…………….14 edge-triggered or 7 level-triggered, non-triggerable switch inputs. Opto-isolated inputs 1 and 2 mapped to switch inputs IN09 and IN10. Either rising or falling edge transitions recognised based on DIP switch settings. See DIP Switch Settings. Outputs…………..14 high-current outputs. One-to-one correspondence between outputs and inputs. Playback…………14 MP3 tracks. See MP3 Track Numbering. One-to-one correspondence between MP3 tracks and inputs. Volume adjustment…Switch inputs IN15 and IN16. Volume adjustment is done in real time and final value is written to EEPROM after track ends. I/O…………………16 unique inputs and outputs. Playback……………255 MP3 tracks. See MP3 Track Numbering. Commands…………Read inputs, change outputs, play/stop track, send configuration file/entry, change volume. See Peripheral Mode Commands & Responses. Configuration File….255 rules supporting 16 Input Edges/Levels, 16 Outputs, 16 Timers, 16 Variables, multiple IF-THEN constructs. See MP3 Configuration File. Volume adjustment…Software controlled. 256 levels in steps of 1.5dB. Click here for Application Notes. Click here for Wiring Information. 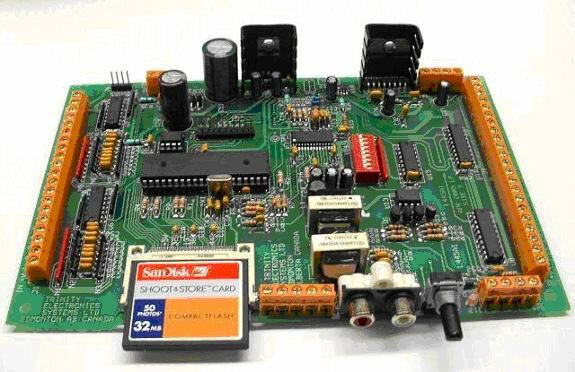 The MPC-494 is a small 50mm x 18mm board which piggybacks on to the serial port of the MP3-445 Compact Flash MP3 board. It controls I/O and MP3 playback based on rules in the user changeable configuration file stored in the Compact Flash. The OPT-466 Opto-isolator board connects to any 4 of the 16 inputs of the MP3-445 to convert them into 4 opto-isolated inputs. RLY-312 Relay Board connects to 4 of the 16 outputs of the MP3-445 to convert them into 4 DPDT relay outputs, each capable of switching loads of 60W/125VA. Click here for detailed specs on the RLY-312.